For some reason, the thought of making pecan pie has always been a little intimidating to me. I guess I have seen some people struggle with the consistency. Too syrupy and you get a mess, not syrupy enough and it’s just too dry, etc. Well, I decided to give it a try. I’m not crazy about using corn syrup, so I decided to try to make my own cane syrup. Well, long story short, I burned the crap out of the homemade syrup. (I wasn’t having the best day. I’m sure I could have gotten it right if I tried it again, but…) I decided to leave out the syrup all together. I know this might be blasphemous, especially here in the South. But, believe me when I say that this is truly one of the best pecan pies I have ever tasted. The consistency is still gooey and perfect. My official taste-testers (the Fella, the Momma, and the Gram) all agree that this is a winner. Add egg yolks, brown and granulated sugars, butter, and heavy cream in a mixing bowl and whisk until well-combined. Add flour and vanilla and whisk again until well mixed. Add chopped pecans and mix well. Let this sit for about 10 minutes to let the ingredients combine. Line your pie plate with the pie crust and preheat the oven to 325 degrees F.
Mix the filling ingredients one last time, then pour into the pie crust. Spread the filling around with a spatula to ensure even coverage. Top with pecan halves. I used a circular pattern around the whole pie. Bake for 45-50 minutes, or until the pie jiggles just slightly in the middle. Serve with a dollop or two of whipped cream if desired. The top of this looks different from traditional pecan pie. It’s a little puffy and even resembles a bit of a crust. I personally love this feature. It’s different, and it’s even kind of pretty. As you can see below, the pecans on top do sink a bit. 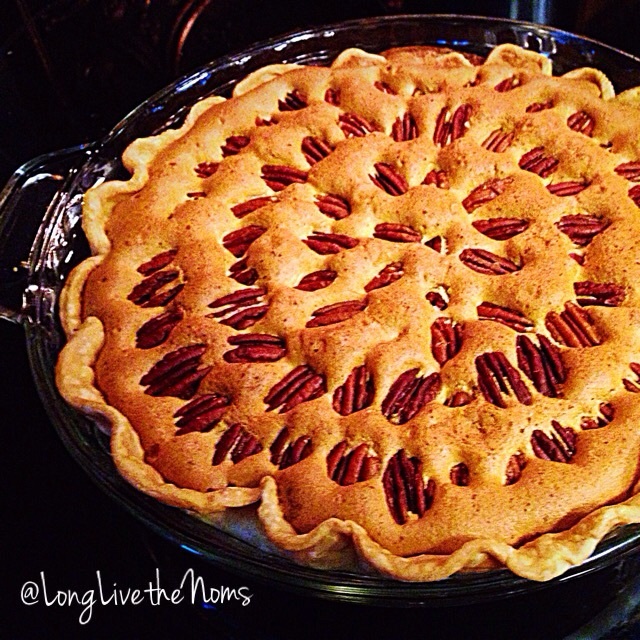 If you would like your pecans to sit on top, bake the pie without the pecan halves, and add them carefully after removing it from the oven while the pie is still hot. The top will still be soft enough to place the pecans, but not so soft that they sink into the filling. I’m going to try this on the next pie to see which method I prefer. This is a perfect recipe for the upcoming holidays. 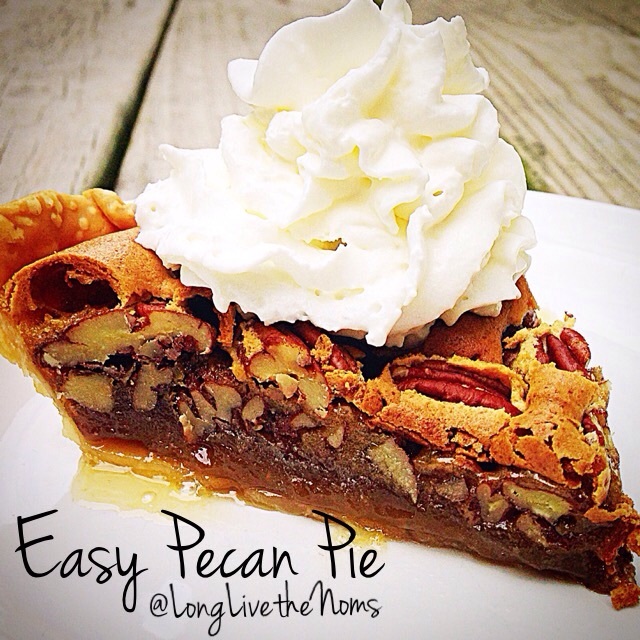 If you’ve always been skeptical about your pecan pie making skills, give this recipe a try. It’s easy and delicious! What is your favorite holiday pie? Let us know in the comments. Posted in Holiday Dishes, Sweets/DessertsTagged baked goods, corn syrup-free, desserts, easy recipes, holiday, pecan, pecan pie, pie, sweetsBookmark the permalink. Interesting idea doing the pie without syrup. 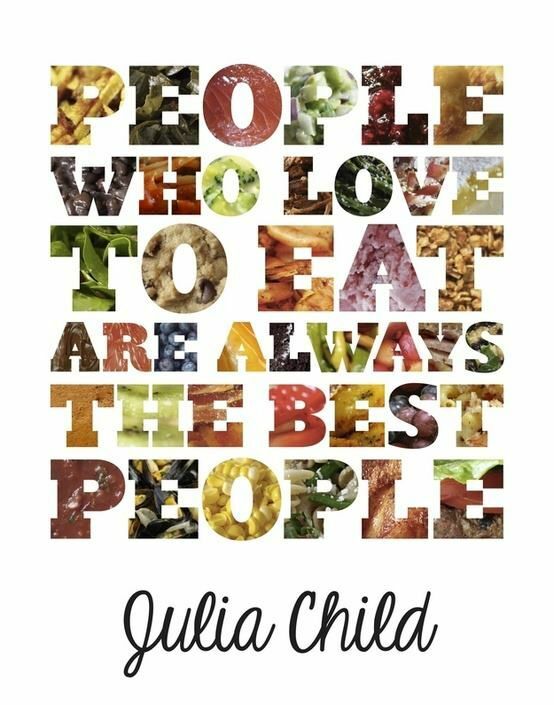 If you and your 3 taste testers liked it, that is more than good enough for me. Next time I want to try a pie, this one will be it. Thank you, Doug! I’ll be honest, since I’ve never made it before, I was just hoping this would turn out edible. It turned out better than I even imagined! While it was baking, the Fella asked, “Have you ever had my Mom’s pecan pie? It’s legendary.” I haven’t had hers, but when he tasted this, he said that it could definitely compete with hers. That was the greatest compliment because his Mom is a wonderful baker. I can’t wait for you to try it out. Be sure to let me know what you think! Pecan pie was the very first pie I had ever made, successfully, so it holds a pretty special place in my heart. Your version looks incredible – even with my sweet tooth, I don’t think I’ll miss that syrup!